Wai Kee Holdings is listed in HKEX with a stock code of 610. The group has some subsidiaries and associates who are also listed in the respective stock exchange. The group owns 39.82% of Road King Infrastructure. Road King Infrastructure invested in a toll road portfolio of approximately HKD4.2 bil, comprising 12 major toll road projects in seven provinces in PRC. For the few years, Road King kept dispose Class I/II highway projects and focuses on expressway projects which able to give higher returns. Road King also involved in property development with land reserve of about 4.5 million sqm across 9 provinces in PRC at 2014. The group also owns 51.17% equity interest in Build King Holdings which offer civil engineering, buildings and environmental to both private and public sectors in Hong Kong. And lastly, the group also owns 94.05% equity interest in its construction materials segment which manufacture and sell concrete and quarrying products. The group's businesses are quite related to each other. From Construction Materials to Construction and to Property Development. Toll road provides steady cash flow to the group. Market capitalization for Road King Infrastructure: HKD5.549 billion. 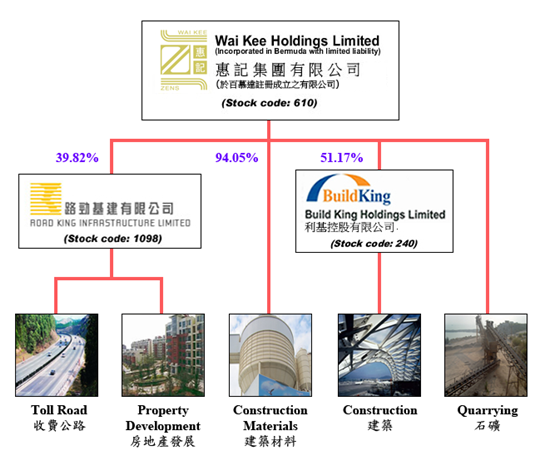 Wai Kee Holdings's ownership in both Road King Infrastructure and Build King Holdings combined is more than its current own market capitalization. So it almost means that you will get the Construction Materials segment for free if you buy Wai Kee Holdings now. So, perhaps it worth a look further? OpenSys: Is its growth sustainable?